Once you are ready to start building on site, your first task is the most crucial of your whole project — building foundations. 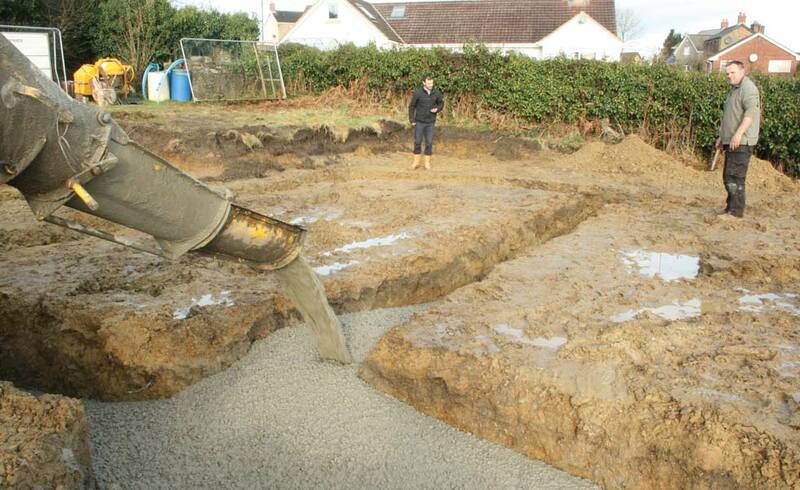 Your foundations are designed to distribute the weight of your new home over a sufficient surface to prevent the subsoil from spreading and avoid an unequal settlement of the building. 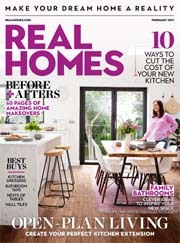 But while your foundations are the crucial starting point to building your own home, they are also an area that can be unpredictable and a contingency fund is essential should you need to adapt your plan once you break ground. It is important to assess the soil type on your plot and choose the right foundation system as errors could cause costly delays. 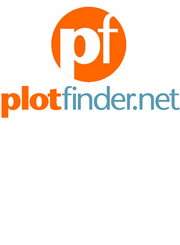 Do I need a soil survey? 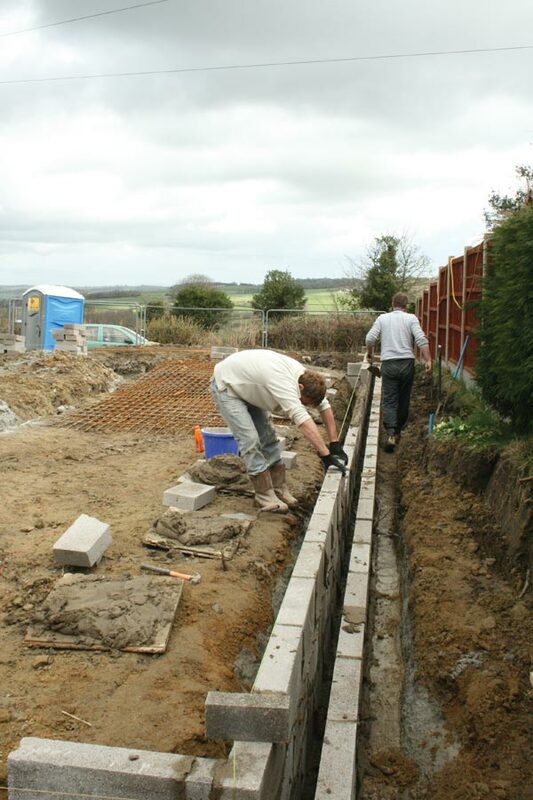 The standard routine is to place as little solid concrete as possible into trenches (minimum of 250mm) and then to build up from this in blockwork until ground level, where the walls switch to brick or stone or whatever the chosen external cladding should be. This is known as a strip foundation. A widely used alternative is the trenchfill foundation, where the trenches are filled with ready-mixed concrete to just below ground level. 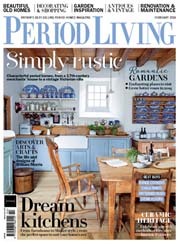 While this method saves on labour, it will add to the overall cost of your foundations. 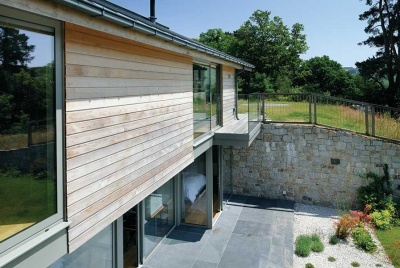 Just above ground level, the footings are topped with a damp-proof course and then the ground floor is fixed. If you have a difficult plot where the ground is deemed to be difficult, then standard strip or trenchfill foundations are unlikely to suit. There are alternative options, but they are considerably more expensive. Digging deeper trenches and filling with more concrete, and potentially adding sheets of polystyrene beside the trenches to act as a slip membrane can be a simple solution. But if you are having to dig beyond 2.5m in depth, then this solution becomes impractical. Not only will the amount of concrete needed to fill the trench become prohibitively expensive, but working at that depth can prove dangerous. If the site requires deep foundations in more than a couple of spots, then it is now usual to use a different approach, most often piling, occasionally using concrete rafts. 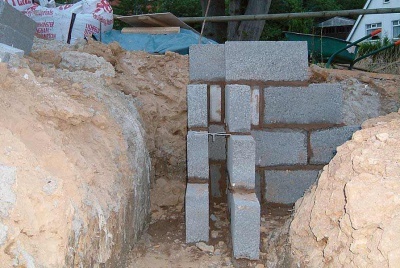 Some housebuilders now use piled foundations on every site because the costs are predictable. Piles are driven into the ground and then filled with concrete, and the whole foundation gets topped with a ground beam to build off. As the name suggests, a concrete raft is designed to ‘float’ on the ground beneath. The structure is made up of an extra-thick floor slab, strengthened by masses on steel reinforcing. 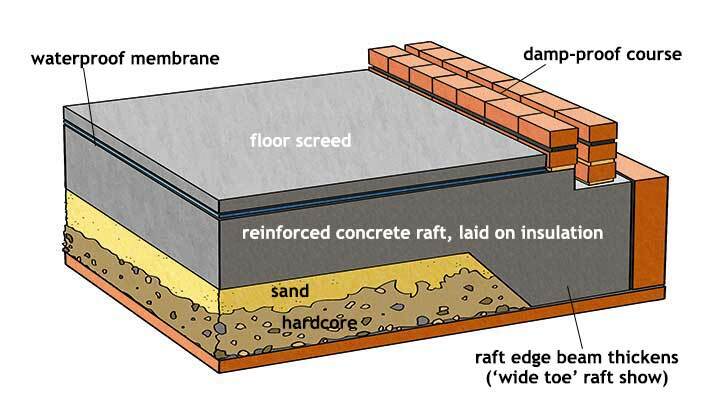 Rafts have the advantage of providing the base of a ground floor solution, not just wall trenching, but they are reckoned to be rather more complex to construct. 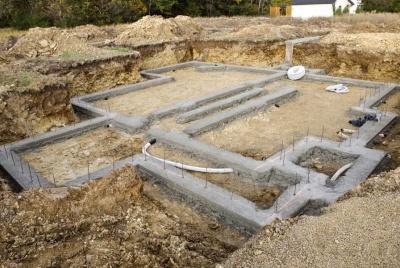 Whatever type of foundation design is assumed at the start of your project, be prepared for that to change due to the ground conditions discovered during the excavation. Costs will vary depending the type of foundation your site requires, with strip foundations being the least expensive option. Unfortunately, the cost of building foundations can also be an unpredictable business. Often, problems with ground conditions only make themselves known when you break ground, which means that even the best laid plans may need to change. Ensure that you have a contingency budget available at this stage to be able to react to any unforeseen issues that may occur and keep your project on track. Soil investigations can prove very useful but are not a prerequisite. Most sites start without a formal soil investigation, relying instead on either the knowledge of the designer, or the local expertise of the building inspector. The process involves holes being dug at various points on the site and extrapolating the findings in each hole to assume the subsoil conditions throughout the site. A datum level must be set up for the eventual oversite level so that all trenches can be dug to accommodate that. On sloping ground, or with a design that employs differing oversite levels, that may mean that you should be prepared for shuttering with suitable 50x100mm timber. to think ahead to getting the services into the house, so get some lengths of pipe or ducting to take through the concrete. Before you fire up the digger you’ll need to decide what’s going to happen to the spoil. If it’s staying on site you may need to hire in a dumper so that it can be stored in a suitable place where it won’t interfere with the build. Otherwise, you’ll have to organise lorries to take it to a tip. The turnaround time, or distance to the tip, will dictate how many lorries are needed to maintain continuity on the dig. You will also need to decide whether you’ll be able to load the concrete directly into the trenches or whether a pump will be needed. If you do decide on a pump – always a good idea if more than three loads are anticipated – then it will need to be booked and the concrete suppliers advised so that their mix and turnaround time can be adjusted to facilitate a continuous pour. Be prepared to change the depth of the dig according to what is found once you start. If you do come across soft spots or bad ground, you may have to go deeper. In certain circumstances, the inspectors may require you to stop and engage the services of an engineer to counteract unforeseen conditions. This is expensive – and your labour won’t be pleased – but it’s the nature of the job. This is where your contingency fund will come in handy. Assuming everything goes to plan, set the string lines again to make sure that no trenches have ‘wandered’ and that the walls can be positioned centrally. 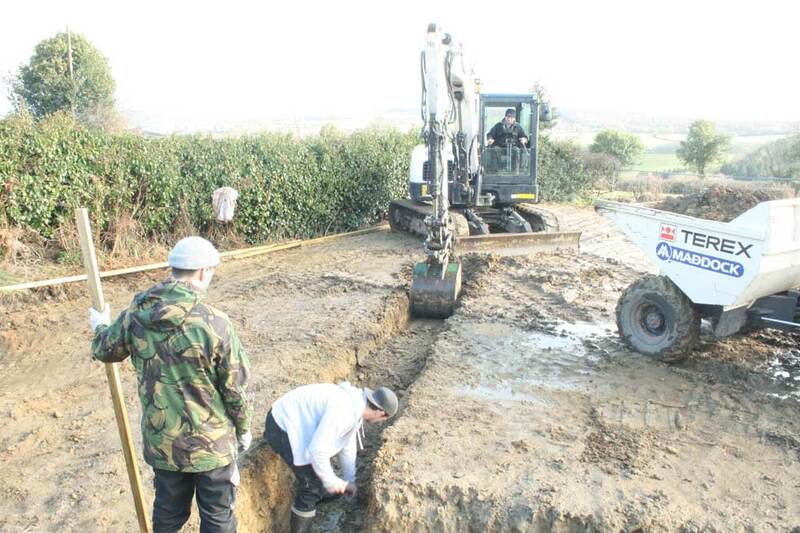 If the digger can’t get back onto sections that have gone off line, the trenches may have to be dug out by hand. The trenches will also need to be ‘crumbed out’. A good digger driver will smooth out the teeth marks as they dig but, in some cases, it may be necessary to get down into the trench with a shovel to clear loose debris or fall-ins. Make sure you check out safety guidelines beforehand. If the ground is uneven or sloping, it may be necessary to employ a foot scaffold at this early juncture, simply to facilitate labour being able to get around the site. The mesh reinforcement to strip or trenchfill foundations is usually positioned 50mm from the bottom of the concrete and 50mm from the top. The lower layer can be laid on proprietary metal tripods or set up on concrete bricks, while the top layers will be pushed into the still wet concrete, so these should be laid out ready and to hand. Any cages can be set on tripods or, more easily, suspended by wire from timber set across the trenches. The concrete should be levelled out and tamped to the previously positioned level pegs or markers. The more level the top of the concrete is, the happier your bricklayers will be when they start to work. 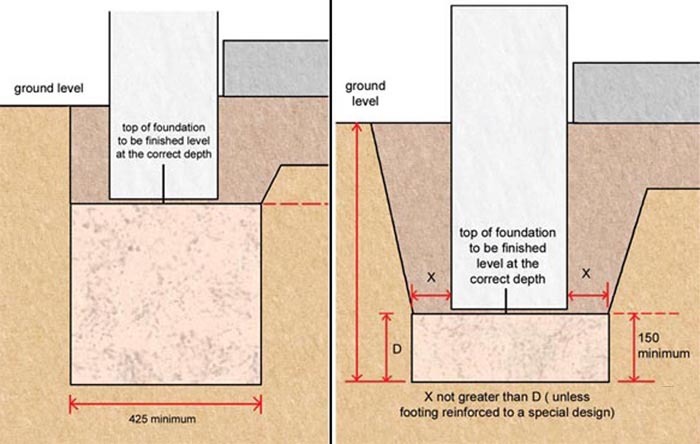 In sloping ground you will need to step the foundation concrete using previously thought out and constructed shuttering that allows for a continuous foundation maintaining a minimum thickness of 225mm through the step. The building and warranty inspectors may require that they inspect the concrete foundations prior to any blocks or bricks being laid upon them. 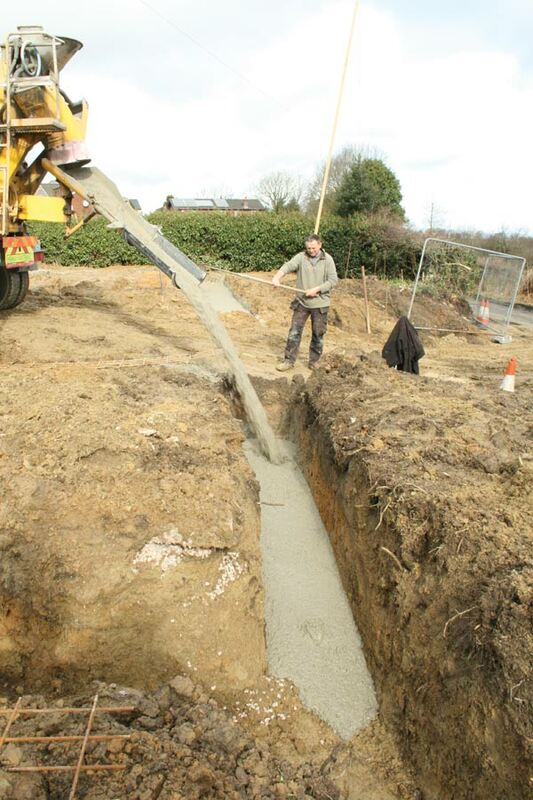 If the concrete is being directed from a lorry into the trench then you need to make sure that there is hardstanding and stable ground for it to park. Lorries have extension ramps but these can usually only reach for around 4m at most. Unless the lorries can off-load at various convenient points around the building, then it’s best to use a pump. 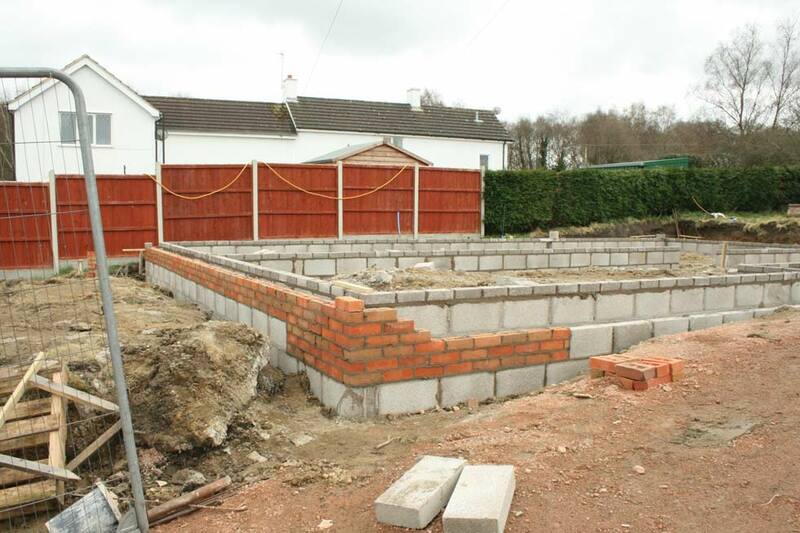 The bricklayers will need to set the building out on the footings using the profiles. All walls must be more or less central on the footings and, therefore, if at this point, you discover a discrepancy, you may need to adjust the building. 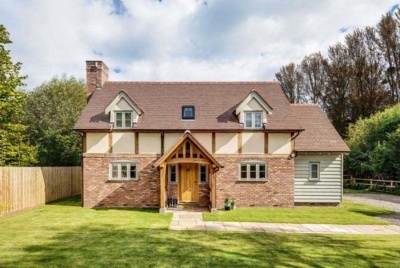 Those intending to use a timber frame must advise their suppliers of any changes, but be aware that although they will be able to accommodate changes in size, they will have difficulty with any walls that are out of square. The bricklayers will build up to damp-proof course level. If this has been predetermined then, hopefully, that level can be achieved with full blocks or bricks. If levels are not critical (for example, if there are no planning conditions dictating a certain level) then it makes sense to take the oversite level to the nearest full block or brick rather than going down the time-consuming and expensive route of trying to cut bricks or blocks. The inner leaf of the wall is usually constructed with concrete blocks or bricks. The external leaf is usually constructed in blocks or concrete bricks to just below eventual ground level and then stopped. If any drainage is to pass through the foundation walls below ground, then it must be ducted so it can move freely and concrete drainage exit lintels need to be built in. 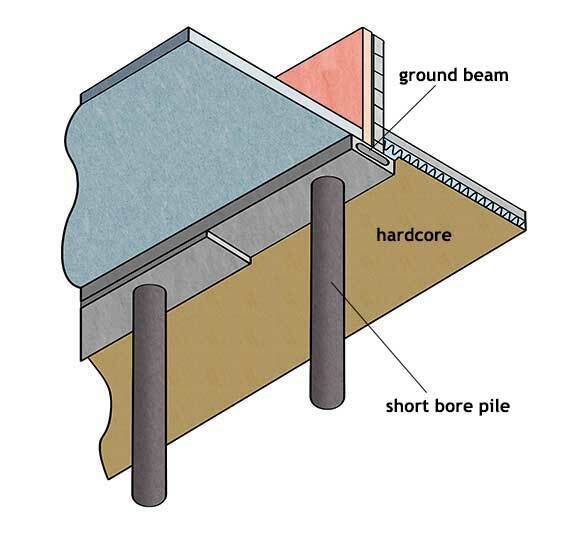 If the oversite is to be a suspended concrete or beam and block, then the cranked ventilators (which allow any build up of gas beneath the floor to escape harmlessly) have to be built in to the foundation walls at the intervals specified. The final step before constructing the oversite is to ensure the cavities below ground are filled with lean-mix concrete to eventual ground level. If your ground conditions appear difficult, you might do well to consider building a basement. 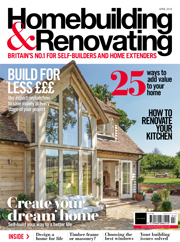 If you are expecting to spend, say, £30,000 on getting out of the ground, then you are maybe halfway towards the cost of a basement and you may find that you are able to add considerably more value to the house than the additional cost of a basement build. What Factors Can Affect the Project When Building Foundations? Where the foundations are affected by tree roots (or their previous removal), you may be required to employ a fairly deep trench filled with concrete but with a compressible material to one or both sides of the external trenches to counteract any heave or expansion in the ground. Water pipes must enter the building at a depth of at least 750mm but no more than 1.35m below ground. If that means that they pass through a concrete foundation then they must either be laid prior to pouring or, better still, a duct installed for them to be pushed through later. If sewage pipes leaving the building have to be deeper than the top of the foundation concrete then they should also be ducted; they cannot be trapped within the concrete and must be able to move freely. Electricity and gas don’t usually need to be ducted or installed at this point as they are normally surface mounted. Finally, the building and warranty inspectors will have to approve the excavated foundations prior to any concrete being poured. How To Build An Underground Bunker On Your Own?